If you know me, knowing I love Harry Potter isn't such a big surprise. What might be a BIG surprise, is the fact that I have started playing Quidditch, right around the corner from my house, here in London! "What? Quidditch actually exists besides the Harry Potter universe?" - you might ask, like a lot of my closest ones have. The answer is YES! And it is THE BEST sport in the world. I do believe the universe puts stuff on our way when we need it the most. And just before the end of the year, I had been thinking about the fact that I needed to do more for my health. I tried going running outdoors but it's so freaking cold in London, that after a few mornings I just lost the will to get out of bed. I had no one to go running with, and so it just felt like torture. I have been a gym type of girl in the past... but I felt like it wasn't for me either at this point. Besides, looking at other people working out gives me anxiety, and I can't help but to also body shame myself all the time so I just choose to stay away from sources of stress like that. So then, one day, I saw the add on Facebook. I couldn't believe what my eyes were seeing, but there it was. 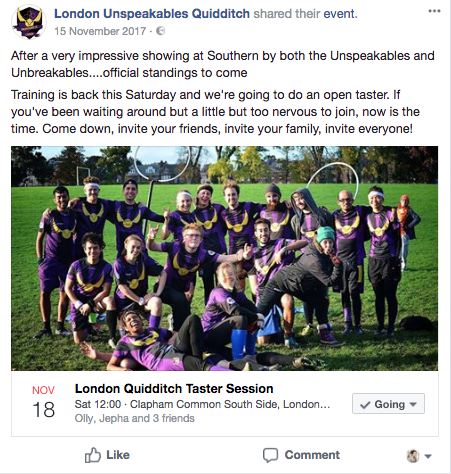 Quidditch existed, and the London Unspeakables were having a taster session for anyone who would like to try it out. From the Harry Potter books to reality, I was on the moon! I confess I had always thought of the possibility of Quidditch. Ever since I read the books. So when November 18th came, there I was: Overly excited, but also really scared and embarrassed. You see... I am known for running funny. And I am probably the worlds clumsiest person ever. To my surprise, and after such a hard year, this was one of the best things I did in 2017, and everyone was so sweet, welcoming and patient. I learned so much... specially when it comes to the rules that were made to best adapt the game from the books to reality. Also, I found out that not everyone is a big Potter head. Actually, the sport goes way beyond the books nowadays, and it is played all over the world! 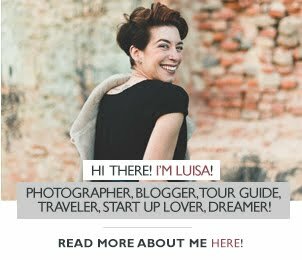 Can you believe my face of shock when I found out there are at least two teams in Lisbon?! My bff Lauren came to Clapham Common with me for support and made some instas tories. Lucky for me because otherwise I would have had nothing from such a memorable Saturday. I still don't know what my position is (Chaser/keeper, Beater or Seeker), but I have been a Chaser on most days. We'll see what the world decides. I confess I liked being a Seeker during the taster session, and I have been told I have a good potential for it, but my body was so broken after an exercise called 'The Hunger Games' where very much like those other books, only one survives (everyone has a snitch attached to their shorts and has to steal everyone else's snitch until only one is "alive"), that I am kind of afraid of doing it again. I won 'The Hunger Games', though. Eeek! This is my fav thing about the London Unspeakables. Ever since day 1 I was welcomed and felt instantly part of the team. Seeing them cheer for each other, the support, the chats and the patience made me look at them like the group I'd like to be a part of. I truly hope to be able to call them my friends one day. But yeah, this is the main thing that makes me go to bed early on Fridays and get out of bed on Saturday mornings. Even when it's raining! Ok. Sometimes I want to dig a hole in the mud and hide myself with shame because I picked up a bludger and ran away with it although my ball is the quaffle. Other days I have picked up a quaffle and hit someone really hard as you do with the bludger. I have mistaken members of the other team to be on my team, and I have failed the hoops, or seen a stream of snot coming out of my nostrils in front of everyone. Still, I have not been screamed at once. I have received positive and assertive feedback, and I have been told to believe in myself more times on practice games than in the past 10 years. Quidditch is such a complete sport. First, you run constantly. And I mean CONSTANTLY. It is also a contact sport, which is new to me, but it also forces me to jump more, go lower more, grab and throw like I had never done before. Quidditch has what is called the 'Four Max' Rule. This means you can only have four players from one gender on pitch at once, which is bloody amazing and so fair! I've been tackled, I come home all soggy and muddy, I've been hit in the face by bludgers, I have had t-shirts being ripped apart from pulling. Some might call it torture, but even though I am still afraid of a few of the things I pointed out just now, still I find myself wanting to come back again. The competition against other teams also makes me really nervous, but I've been told it is really fun. I had to add this here. But being Harry Potter one of my fav things on earth, no other sport can beat Quidditch ever and ever and ever! Right now it has all been about absorbing as much as I can when it comes to rules and learning how to play it well. But I also really feel motivated to get into shape asap to be able to contribute more to the team. I just really wanted to share with you how happy I am for being back into a sports team. 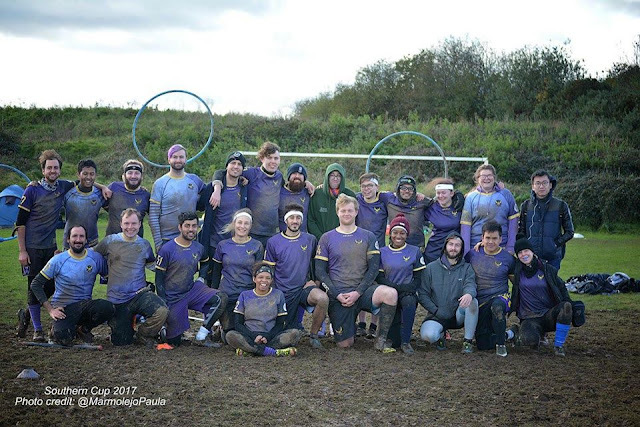 You can see and learn more about Quidditch here, here and here! Suddenly I realised that by putting myself outside my comfort zone and playing Quidditch I was actually making one of my biggest goals for 2018 and what I know is one of my best decisions so far!